This bilingual map shows the geography of the northern circumpolar region, north of approximately 55 degrees, at a scale of 1:9 000 000. The map uses the azimuthal equidistant projection. It includes all international boundaries, as well as the Canadian provincial and territorial boundaries and Canada's 200 nautical mile offshore exclusive economic zone. National capital cities are shown, as are other cities, towns, villages and hamlets. Some seasonally populated places are also included. The map displays a number of significant northern features, including the median sea ice extent for September 1981 to 2010, the tree line, undersea relief, land relief, the Magnetic North Pole, glaciers, ice fields and coastal ice shelves. Many of the physiographic and hydrographic features are labelled. 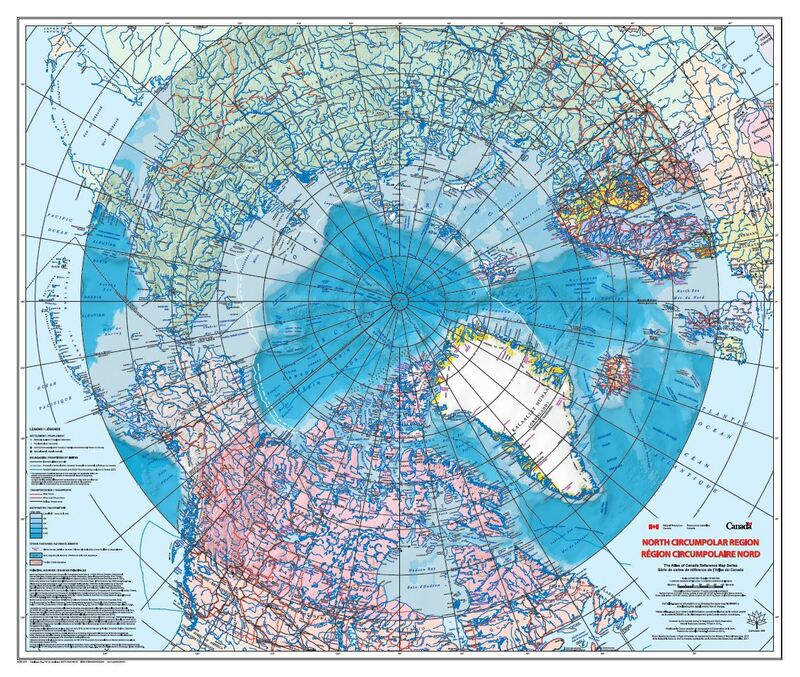 North Circumpolar Region (2017) This bilingual map shows the geography of the northern circumpolar region, north of approximately 55 degrees, at a scale of 1:9 000 000. The map uses the azimuthal equidistant projection. It includes all international boundaries, as well as the Canadian provincial and territorial boundaries and Canada's 200 nautical mile offshore exclusive economic zone. National capital cities are shown, as are other cities, towns, villages and hamlets. Some seasonally populated places are also included. The map displays a number of significant northern features, including the median sea ice extent for September 1981 to 2010, the tree line, undersea relief, land relief, the Magnetic North Pole, glaciers, ice fields and coastal ice shelves. Many of the physiographic and hydrographic features are labelled. Sawmilling is an important Canadian industry. Its plant locations are widely scattered across Canada, predominantly in the coniferous forest region. This map shows sawmills whose production exceeds 10 000 cubic metres of lumber per year. The map symbols indicate the size of the mill and the type of lumber it produces. The map was originally published online in the Atlas of Canada, 6th Edition as an interactive digital map derived from a shapefile and mapped online using MapServer, a platform for publishing spatial data to the web. In order to preserve the geographical content of this Edition during its publication from 1999 to 2009 all the maps have been converted from their online interactive form to a raster and made available in PDF and JPEG. 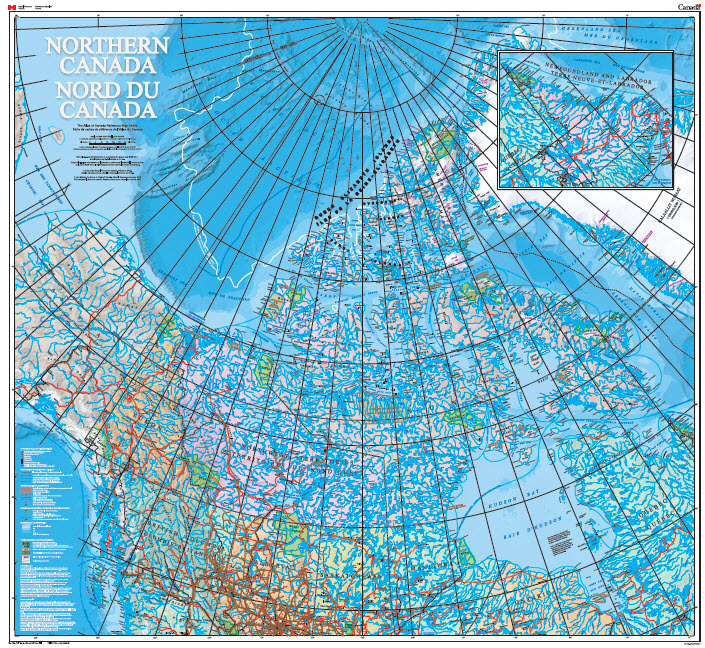 Contained within the Atlas of Canada's Reference Map Series, 1961 to 2010, is the largest of the Atlas of Canada wall-maps, this colourful new edition (Nov 2009) features several significant information updates. Approximately 150 place names have been added/renamed -- particularly in northern and rural regions. Populations have been updated to reflect the 2006 Census. All national parks are shown, including the expanded boundary of Nahanni National Park and Lake Superior's new National Marine Conservation Area. Road categories have been revised to reflect the additions of new multi-lane highways. All provincial, territorial and international boundaries are depicted, including the Northern sector and Canada's 200-mile offshore Exclusive Economic Zone. Relief shading highlights the physiography of the country and the map's projection provides a three-dimensional view of Canada. An outline map showing the World in the Robinson Projection (with central meridian at 0° W.). This political map of North America shows national boundaries, country names and oceans.